Today I'd like to share some of my favorite Thanksgiving ideas that there is still time to pull off. 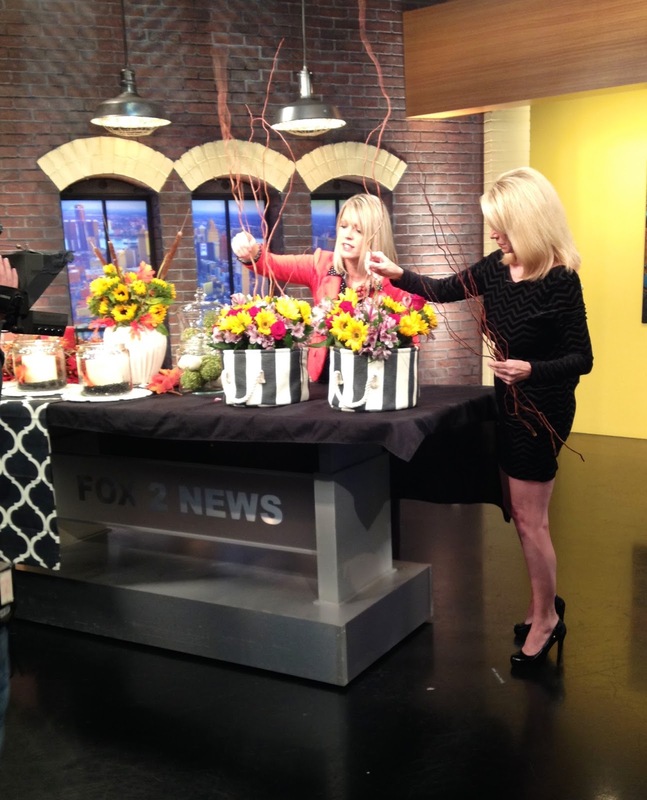 Recently, I was a guest at Fox 2 Detroit for a live segment where I shared a few show-stopping fall centerpieces that I put together with items from the super market. 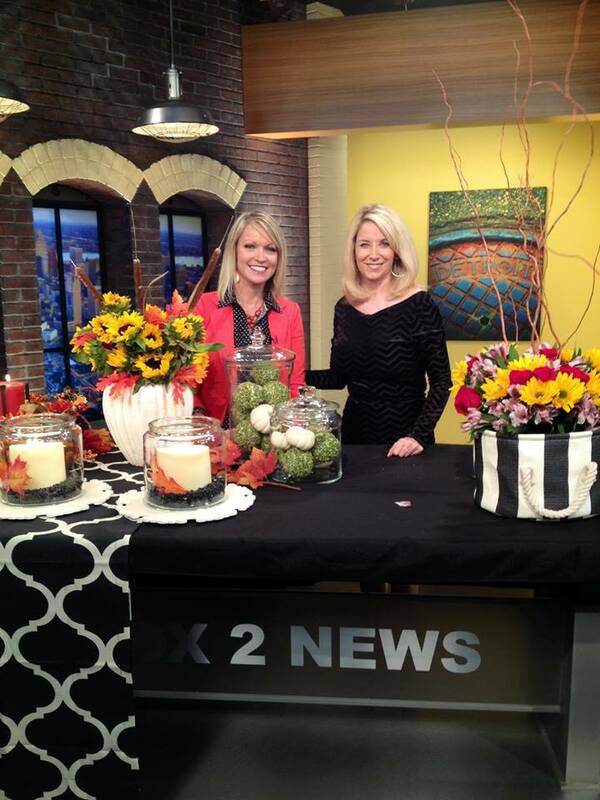 For this live TV presentation, I wanted a bold, graphic table runner that would make my simple fall centerpieces pop. I couldn't find a table runner or table cloth that had a pattern scale that was large enough for my liking, so I went to the window treatment aisle at Walmart. I bought an inexpensive, black and white trellis print drapery panel and folded it in thirds to use as a runner. This trick could easily be used on your Thanksgiving day table. While on air, I demonstrated how easy centerpieces can be to put together by challenging the news anchor, Kam Carman to make one. She did a fabulous job! Following my simple tutorial, in just a few minutes, she created a beautiful, eye-catching arrangement that is sure to get attention on any table. It was the "Centerpiece in a Tote" that Kam and I assembled and I wrote a blog post with a tutorial. If you would like to make one, please click here to view. Another example from this round up was the Vanilla Coffee Bean Centerpiece. Using fresh coffee beans and a scented candle from the grocery store I filled three of my glass kitchen canisters to create a centerpiece trio. This little project will have your house smelling absolutely divine. 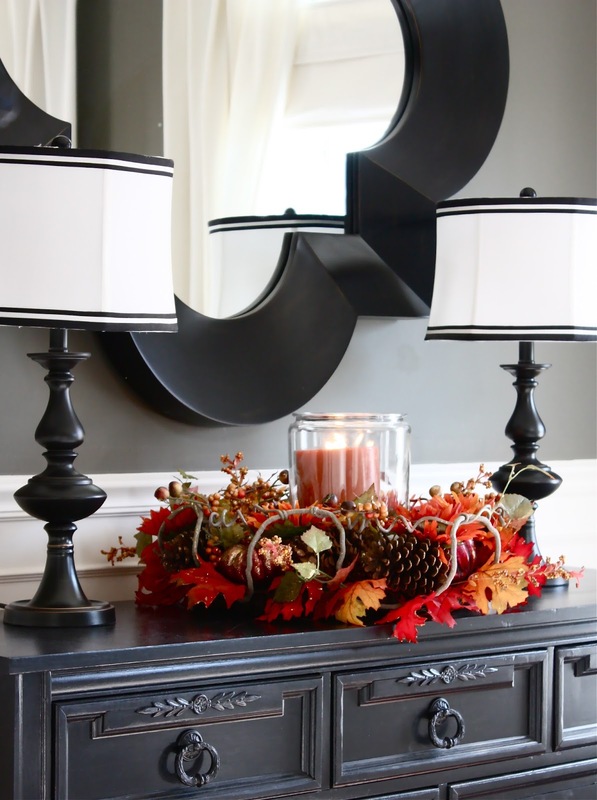 Another simple idea that looks like it took hours to assemble, is to use a pre-made wreath to create a colorful, large scale Thanksgiving centerpiece, the tutorial for this one can be found here. If your out and about today gathering supplies for your table, stop in at your local thrift store. 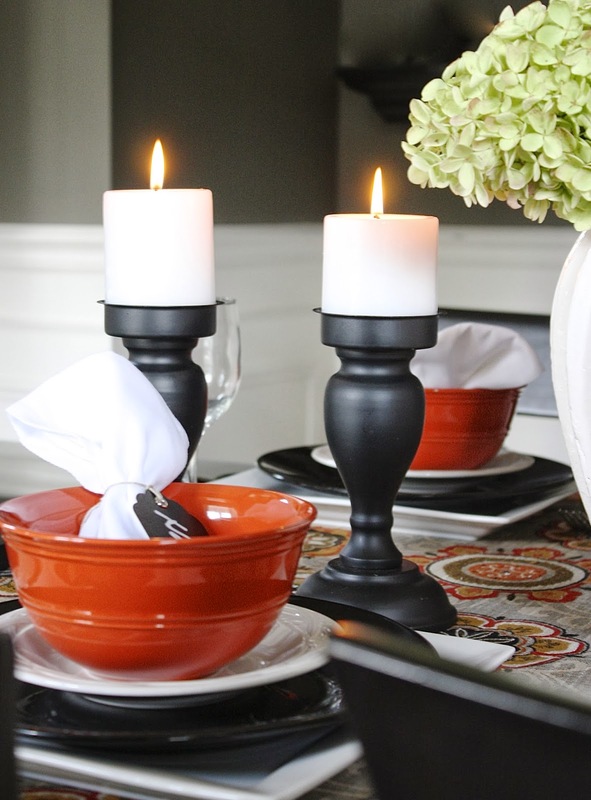 This is a great way to add to your table setting. Whether you need a few extra place settings for extra guests, bar ware, additional serving pieces, or you would like to mix and match some "new" pieces in with your old to create a new look, the thrift store makes it fun and affordable. 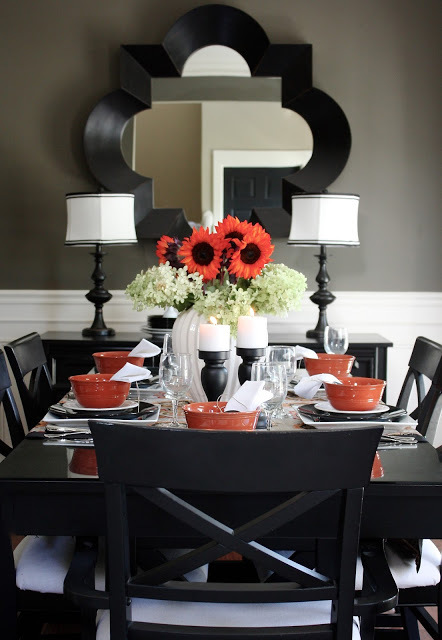 This post shows how I created a Thanksgiving table setting using thrift shore pieces. One Thanksgiving I decided to flip flop our dining room furniture with our living room furniture for the big meal. This allowed me to place the dining table in front of the fireplace for a cozy atmosphere. I wrote a blog post all about it, here. You can also see I used the coffee bean and scented candle trio centerpiece that year, only I used lanterns instead of my kitchen canisters. I also made some very simple, but very cute place cards by sticking chalkboard labels (from the office supply store) into fresh artichokes. These looked cute on the table and tasted great the next day. This is one of my favorite no-sew projects ever. A yard of his tapestry weight fabric from Hobby Lobby (still available) makes the perfect Thanksgiving and Christmas table runner. One side has a gorgeous autumnal color palette, while the reverse is a stunning combination of gray, black, red and white which is perfect for Christmas. Click here to see how I made this runner in just minutes, Two Seasons, One No-Sew Table Runner. 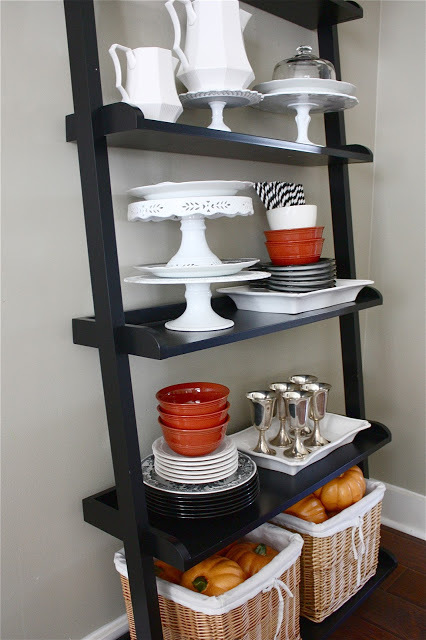 If you are prepping for guests and you are running short on space for your serving pieces, this post is for you. Here, I emptied a bookcase and used it as a make-shift butlers pantry for the holidays. It looks festive and it is extremely helpful allowing me to prepare for parties in advance. Ok, this is a fun one. This idea is really simple. I love to do this over the kids table. By now, all the stores have their Christmas decor out. While your out today, grab a package of autumnal colored Christmas ornaments and some pretty ribbon to decorate your chandy. Here is a post I wrote on this idea. The last, last-minute Thanksgiving Day idea I'd like to share is the simplest yet. This centerpiece was made with dried hydrangea cut from the front yard and a bouquet of grocery store sunflowers. If you are running short on time, just grab a package of flowers on your way to the eggnog aisle and you can have a stunning centerpiece that will wow your guests. Please click here for the tutorial. Happy Thanksgiving! Enjoy your family/home time. Great tips - thanks for sharing! Happy Thanksgiving to you and your family! Love the coffee bean and candle idea!